Psalm 90 is a prayer of Moses. “Lord, you have been our dwelling place throughout all generations. 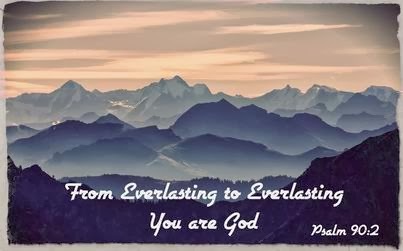 Before the mountains were born or You brought forth the whole world, from everlasting to everlasting You are God. Moses, the man of God, knows from the depth of his heart that only God is everlasting. Everlasting in Hebrew is “Olam”. Olam means forever, everlasting, continuous existence. God exists outside of time and space, before all matters came into being. He has always existed in the past and will always exist in the future. God is immortal. He is the Eternal God, not limited by time. This means God is there all the time. God is there to answer us when we truly call upon His Name anytime. What a great privilege we have as His children. Let's truly call on our Everlasting God in prayer now and forever.